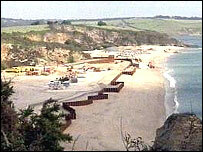 Controversial plans for new sea defences at a Cornish holiday complex have been thrown out by the government. A public inquiry was held into developer Ampersand's plans for an upgraded sea wall to protect the development at Carlyon Bay. Opponents to the scheme said they were concerned about the impact the wall would have on the beach. Ampersand said it was surprised by the decision to refuse permission to build a revised sea wall. It said in a statement that it would consider the decision and make a further announcement in due course. It said it was still committed to building the £200m resort, made up of more than 500 holiday apartments.